What is most disappointing about where you live? I live in a place between two ears, both of which seem more red and mottled than they have in the past. I've lived in many places. I first lived in a little yellow house in Seattle where I can't quite remember what my room was like. I can remember the living room and the kitchen and another room just off the kitchen, but I can't remember the room in which I slept. Odd. For the first five years of my life I can't remember where I slept. I remember the bathroom. Or was it the half bathroom? A toilet training memory, perhaps, which, I have learned from books, can be stressful. I remember my sister arriving when I was four. We didn't have pets. My memories of the yellow house are a string of stressful incidents. Maybe that's what you remember of the time when you are little. I'm not sure I would want to go back. We moved north of Seattle to a house of my father's design. One story with walls of glass, great expanses of glass running along the living room and around the corner to the kitchen. It was nice. My father had been invited by Frank Lloyd Wright to join his office in the Southwest (I forget where he had his office, but it was famous, even then.) and turned him down because Wright ran a kind of communal not paying very high wages everybody lives together thing and my father was really tired of being broke. But he respected Wright and I suspect our house north of Seattle was a Frank Lloyd Wright like house. I remember my room. It was small with built in bunk beds and a wall paper map of the Olympic peninsula glued to the wall. It was pretty hip and I was lucky to live there. We had a Red Setter named Laddy and he and I would wander for hours through the woods. I don't know what I really think about it anymore. Laddy killed one of the neighbor's chickens so we took him to the pound and left him. At the tender age of twelve I moved with my family to Westchester County, New York, just outside of the town of Bronxville. We did not understand that Bronxville, in addition to being a very rich little town, at one time the richest little town in the United States, was also known for its anti-Semitism and a certain coolness toward hicks. We did not live in Bronxville, although we had a Bronxville post office address, and we learned very early on to say (truthfully) that we lived in Yonkers. Remember Yonkers? You don't. Well, Yonkers is a regular sort of New York sort of a city filled with regular sorts of New Yorkers and you could say you were from Yonkers without anybody raising an eyebrow. We lived in a big old four bedroom New York stucco house in a well to do neighborhood and my father commuted to work every day on the train to go to his office across the street from the New York City Public Library. I had a small bedroom that shared a bath with my sister's. I would not like to go back there, either. Some wouldn't understand that. We had a dog, but he died. I lived for one year except for the summer near the town of Sheffield, Massachusetts, better known in later years as the home of Alice's Restaurant, in a dormitory at a prep school for boys. One year was enough. Had I gone two years, you would not recognize me. Three years and I would not recognize myself. I went to school at the University of Washington in Seattle and I lived in a fraternity house for five out of the six years it took me to graduate. They were good friends, my fraternity brothers, a little geeky to be Greeks, engineering students and computer guys, but mainframe computer guys. Business majors. A couple of accountants. A music major who went to Julliard after he graduated and a forestry student. I wouldn't want to return there either. The army was done in a Quonset hut. Hut! I lived in San Francisco, first, for a couple of months, in a condemned building near City Hall at the first home of the old Rip Off Press, then Nob Hill, then Sausalito, then Twin Peaks and then Potrero Hill for the last ten of those twelve San Francisco years in a ramshackle flat with ramshackle long haired friends cranking out comix in a warehouse district at the bottom of the hill. I remember visiting that flat for the first time, climbing up the stairs at night to find a living room painted dark red with black trim (the fabulous Beatrice having become ambitious with a paint brush) and a gas fire heater keeping it warm. I would not mind returning to Arkansas Street, but only to visit, to see if the entire city of San Francisco still spreads out below it from the back porch. I had a cat in San Francisco. She was a good cat. She came with me when I moved to Napa. 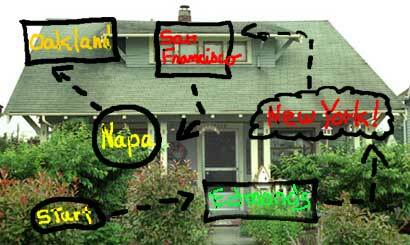 I lived in Napa for twelve years, the last one a single bedroom apartment in an old Victorian house with 12 foot ceilings and wonderful tall windows. I ran a Novell dealership out of that apartment, so it was filled with workbenches and computers and a couple of cats. I liked that place, but I was there too long. I shouldn't have taken the winery job, but stuck instead with my job as a marketing writer in San Francisco. But I didn't. The cats died in the streets dodging cars, every one. I now live in Oakland. It has always had a reputation for being too black and too poor with too much crime and abysmal schools, but this reputation is crumbling and it is going to become a high rent rich city suburb of San Francisco pretty quick and I should probably think about moving. If I were smart. Which I am not. I have a cat. His name is Wuss. He's on a diet. What is most disappointing about the place where I live? The ears, I think. Mottled red. The photograph is a recent photograph of the little yellow house. The arrows and boxes are an idea that didn't work.